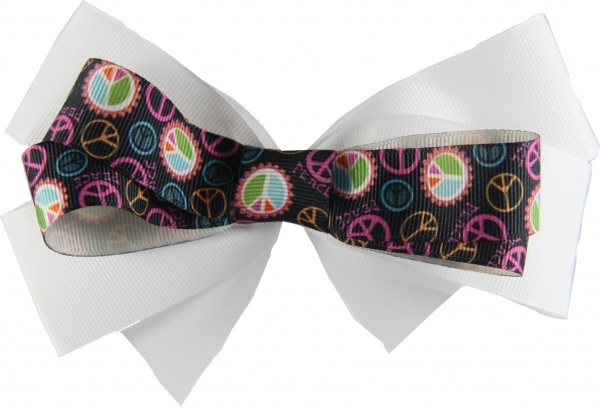 Peace Signs Rule on this Bow, the peace signs are all over this bow in pink, orange, blue and lime. The word "Peace" is written several times. The top layer is a black grosgrain ribbon 7/8" wide. This is a double layered bow that has two clips on each ribbon. This is a stacked bow and can also be worn each by itself. The bottom layer is a white grosgrain ribbon 1.5" wide in a boutique style bow. The center has a flat center so the peace sign just slides right on top of the white bow. Peace Out!